We hear from restaurant owners a lot, who try to convince us to check out, and ultimately review, their restaurants. We play hard to get. The only person who can actually drive us into a restaurant to check it out is you, the reader. If you have a great meal, tell us. We want to know. That being said, here's a tip for you, fine restauranteurs, on how to lure The Infatuation into reviewing your restaurant: open an oyster bar. You're pretty much guaranteed to have one of us sniffing around pretty quickly to see what's shucking. Some people pop pills or smoke weed for a good time. Our idea of elevating the fun is a dozen oysters and plenty of mignonette. Sel Rrose is a couple of years old now, and was somehow hidden from us in plain sight. A cocktail bar with a full raw bar, and big selection of oysters across the street from Bowery Ballroom? Sign us up. It's a beautiful room that feels like an art studio where important people splatter paint onto walls and then sell them for lots of money. We dig the vibe. 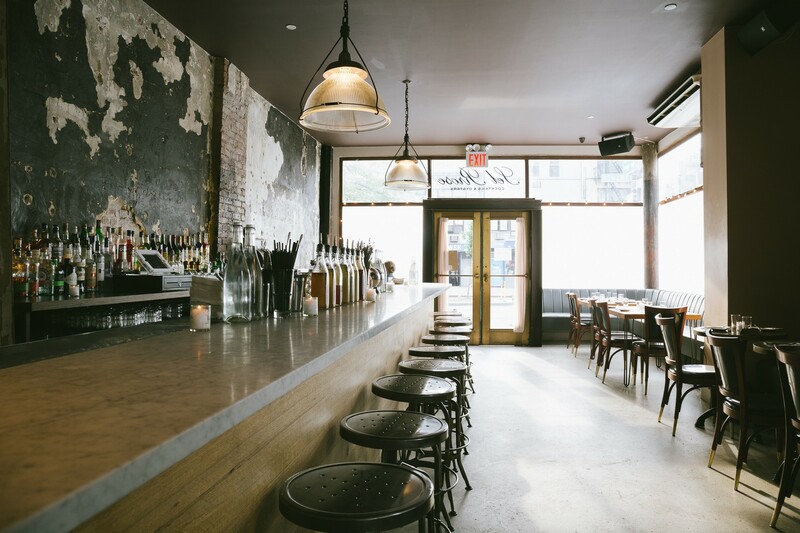 We also like that Sel Rrose is a serious oyster bar, with a full on raw bar room/nook/area (which is where you need to sit), and typically around 10 different kinds of oysters on the menu daily (that's a lot). They've definitely got a lot going for them, but there's something just a little off about this place. Maybe it has something to do with the double "r" in their name. For example, on a recent visit, after our server neglected to bring us an oyster menu, we simply told him to deliver us a couple dozen, a variety of whatever was fresh, and we made it pretty clear we were excited about it. He came back with two big platters, but had no idea which oyster was which, or any desire to figure it out. We asked questions, he simply shrugged, said he was sorry he forgot, and then went back to eating his own burger behind the cash register. Come on Sel Rrose people, THIS IS HOW WE PARTY. We will say, the Sel Rrose burger is pretty damn good. Maybe he was just preoccupied. Still, it just seems to be the approach to service is more cool than chummy, with minimal respect being given to the oyster foundation we had hoped they'd be a part of. A turn off, to say the least. Although everything didn't turn up r-roses for Sel Rrose, we'd definitely come back. They have a 1$ oyster happy hour from 5-7pm daily. Just don't expect an oyster education. East Coast, West Coast...they've got a number of varieties, good luck figuring out which ones. We will say, their mignonette is good, and all the oysters we've had here have been fresh, freezing cold, and delicious. A very solid appetizer, although they need to re-think the vehicle for dipping that they send out with it. A dense "crisp bread" is served, but we'd rather have tortilla chips or something not so filling, so you can pound more of the dip. Simply put, this is not a good lobster roll. Gummy lobster, and too much bun. Having a bad lobster roll on your menu is sinful and also very hard to do. It's also the main reason this review came in under a 7.0. Surprisingly, the best thing on the menu at Sel Rrose is the burger, which we'd definitely order again. Bacon, caramelized onions, avocado - it's a serious meat sandwich that'll do you right. An average slab of beef slathered in salsa verde and served with fries. After a couple Sel Rrose cocktails, which are pretty stiff, this would really hit the spot though.